It’s not quite a marshmallow world yet, but this morning we woke to a frosting of snow lying quietly over everything and there was a definite almost-Decembery feel in the air. November, get gone. December, how do you do? 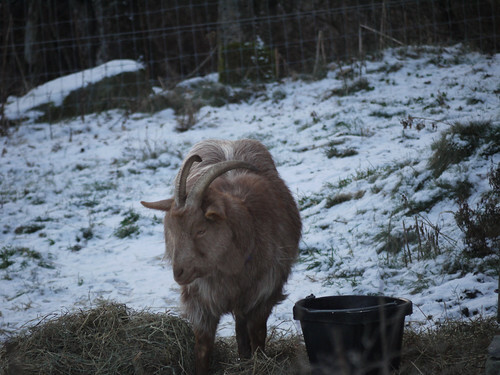 The colder it gets, the more grateful I am for that heated stock tank we have for the goats. I get a little shiver of happiness every time I walk past that tank on my way to the barn and see beautiful, ice-free water shimmering in there. Still, even though it’s unfrozen, it’s probably only about 40ºF. 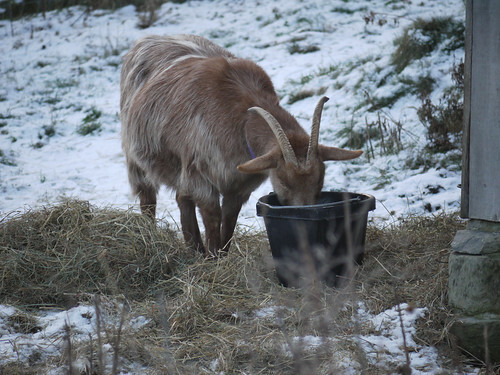 The goats don’t seem to mind, but it always seems to me that they need a nice warm drink. So, on a morning like today, I make tea for me. And “tea” for them. Theirs is just a bucket of hot water with some molasses mixed in. They don’t need the molasses, but I figure a little bit of sugar is a good thing when you’re trying to stoke your internal fires on a cold Vermont day. When I first started doing this, I wondered if the water I was taking out was too hot for the goats, but they don’t seem to mind it hot from the tap. Did I ever mention here how satisfying it is to watch a goat drink? None of that annoying, painfully slow lap-lap-lapping that cats and dogs have to do. No. 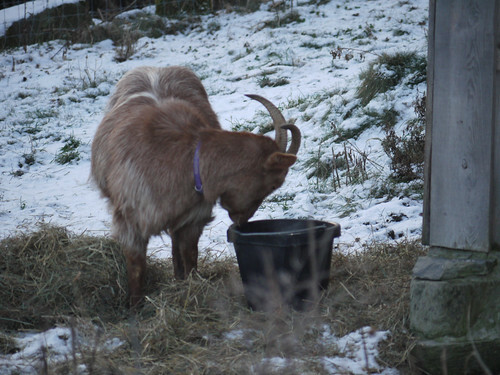 A goat just puts her lips into the bucket and drinks deeply. Ahhh. 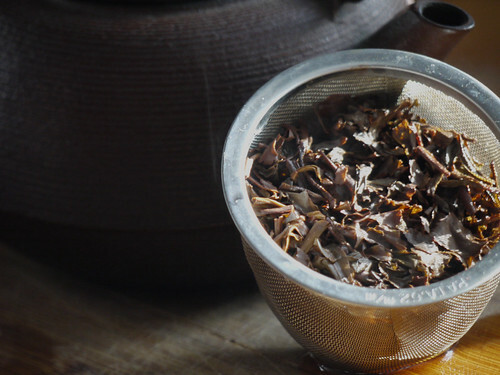 My usual tea is green, but today I started my day with a dark black Ceylon, steeped for four minutes, then served with a little bit of honey. It was just enough of a kick start to get me out to fetch logs and build the fires. When I finally sat down to work, the old song, “Sweet City Woman”, came drifting into my head. Who knows why this silly summery song came to me on this bitter cold morning, but it was a welcome warmth for my brain. Say what you will, hate it or love it, it’s not a sad tune. Who was it who said you can’t play a sad song on the banjo? Billy Connolly? Steve Martin? Willie Nelson? Well, whoever said it was right. Now that I think of it, maybe I ought to trade that cello in for a banjo? Ah, sharing a cuppa with the goats!! 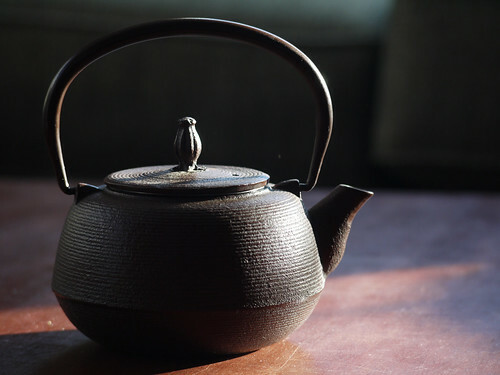 I need a pretty teapot like that. 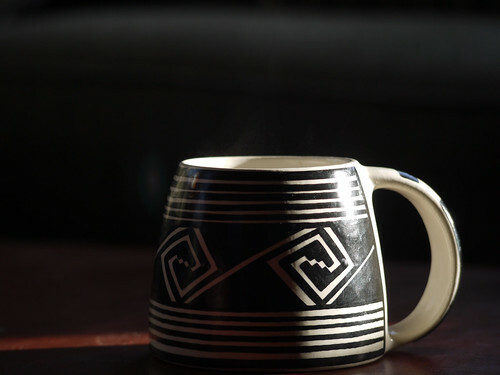 =) I like your mug, too. I usually drink black tea, but I always put a bit of milk in it.